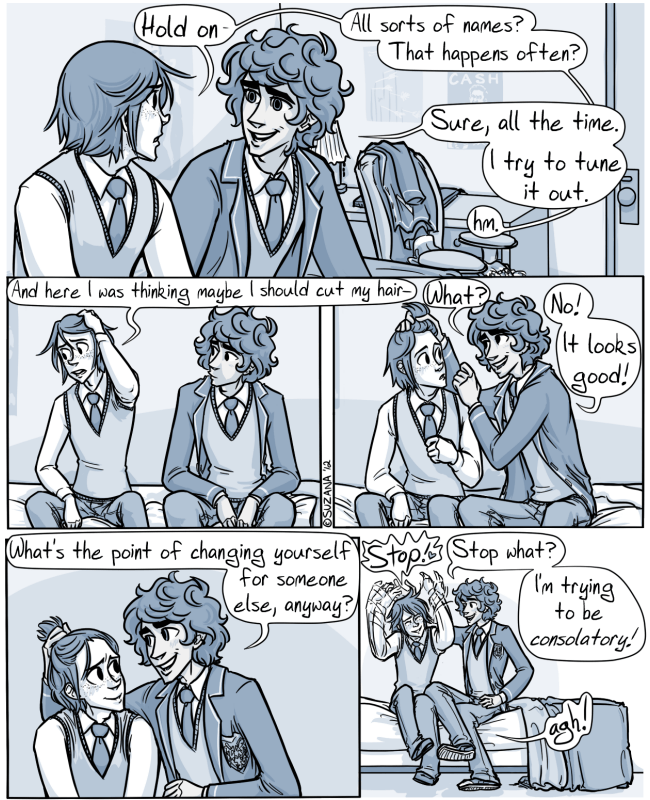 The last gay romance webcomic I blogged about went on a quick hiatus (Hazel & Bell are both students after all!) so I was going to blog about another one to make it up to y’all… But Always Raining Here returned from hiatus before I got around to it… But whatever, the more gay high school romance webcomics the merrier, right? So yes, Tripping Over You, by Suzana Harcum and Owen White, is an English boarding school-set romance between two pals who decide to be more than pals on the sly. It’s really cute and there are four full chapters in the bank, with the fifth one underway. It’s always fun to see people’s art improve over the course of their comic, and that’s certainly true of Suzana’s art here. One of the distinctive visual features of the comic is the blue and white color scheme, but in the current chapter they’re actually using full color. Took some getting used to, but gotta applaud artists pushing themselves. Start at the beginning here. Suzana and Owen have a Kickstarter to collect the comic in book format, and it has been wildly successful, with $11,000+ pledged for a $2,500 initial goal!